Attached to such concentrated and detailed work is a towering price. 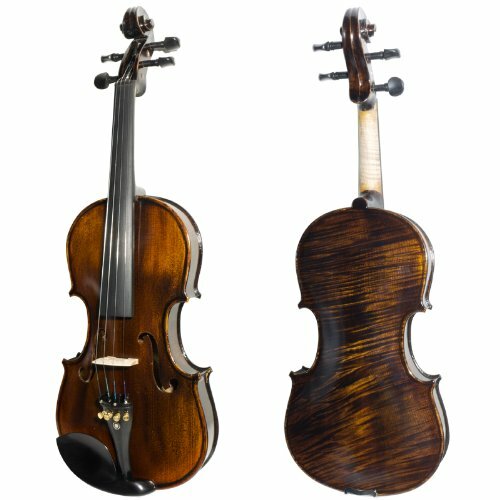 Violin sales persons are shameless in calling for pretty pennies – modern, handmade violins can sell for from 35,000 dollars to 195,000, and especially rare or renowned ones have been purchased for millions. These are used by touring musicians, by acclaimed studio artists, and by folks seeking to add an antique touch to their living room displays. Fortunately, there are options that bear significant refinement and are affordable for the average citizen. Some violin-making companies produce on a large scale, keeping in mind that likely customers include young test-triers and people who do not see value in spending entire life savings on a small wooden item. Their instruments, though many, are fantastic for beginners and growing students, and are formed using quality methods that get jobs done satisfyingly. While a sizeable amount of these makers sell at walk-in shops or establishments, many utilize online marketing to reach their audiences. This makes their products incredibly accessible, allowing for anyone with some savings to purchase and receive an instrument within a matter of days, in a few minutes. Today’s tools make finding a superb violin easy, and much worry about a lack of time to help your child play music can be cast aside. The trickiest part of online shopping endeavors, especially regarding musical instruments, is knowing what is good and what is not. With no real instrument on display or open to touch, buying can be nerve-wracking, and much trust in words on screen is needed in order to feel comfortable with clicking even ‘add to cart’. This article is meant to alleviate shopping anxiety by giving readers a list of violins that are made by the trustworthy company, Mendini. Mendini violins are known for their low prices, their diverse colors, their comfortable playability, and their adherence to top standards. Though they are cheap, they are of good quality, and they present a mix of sleekness and sturdiness; they are visually classy, and physically durable. Meant for students, they can provide new learners with some years of training, and can fit into a youth or school orchestra setting well. This article will remove much hassle that can come along with online shopping. The Mendini MV300 is a “satin antique violin”. It is an autumnal shade of brown with an overtone of red, and its color matches its voice gorgeously. Made with spruce and maple woods, it hold to standards set by other instruments, and produces the sounds they do clearly. The MV300 is capable of emboldening any young player, and has attributes that provide beginners with any means necessary to achieve a desired sound. Capable of conveying fluid motion and of swaying the ear with its wondrous productions, it is rich in sonic texture, and is known to produce a collage of artistic vibrations. 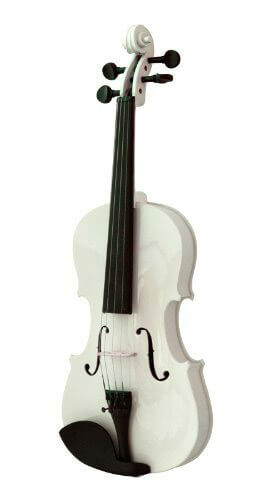 Standard black tuning pegs, chin rest, tailpiece, and fingerboard put the violin in its place amongst industry-level makes, while unique resonance distinguishes it from other companies’ products. The wood-work of the object is clearly visible, as streaks skim the face’s surface stylistically. The interior of the violin, where sound echoes and is given its volume, is shaped excellently, and the sound-post inside allows for magnificent resonance. 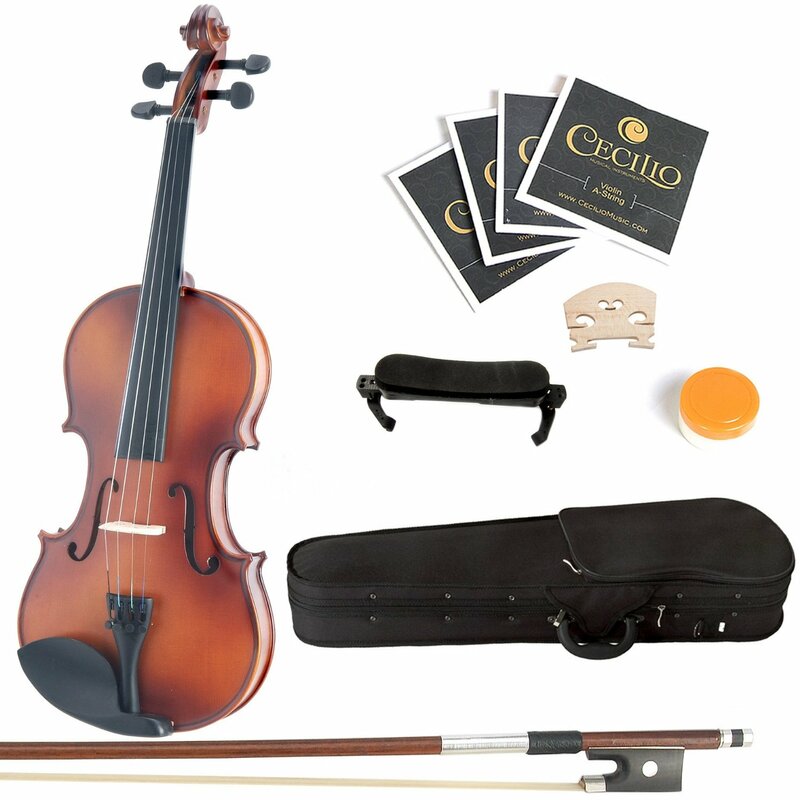 In online packages, the violin comes with several additions. A light case is offered (an instrument without its case is like a baby without its clothes), and a bow made with Mongolian horsehair is attached. Rosin is supplied, as well as a shoulder rest, two bridges, and an extra pack of strings. With all of its add-ons, the deal is excellent, and, especially for beginners, should be greatly considered before being passed over. The MV200 is a toasty-brown color that can impress an audience with its warmth and rosiness. It can operate well on any stage, whether in a solo recital or in an ensemble performance. It easily blends with the shades of other instruments, and a visual artist might describe its body as appealing in any context. Its design is stylish, and it retains the shape of professional-quality instruments. The sound that comes from the MV200, while capable of depth and warmth equivalent to the violin’s color, can be bright and explosive, able to strike the hearts of listeners with the intensity of lightning, and to instill a spirit of wisdom and glory. It is resonant and alluring, and can effect an audience with feelings of conquest and potential for massive achievement. Bold and radiant, peaceful and melodic, the type of sounds that the MV200 emits are expansive, and exactly what teachers and students call for when searching for an instrument. The MV200 is made with black tuning pegs, a black tail piece, a black chin rest, and a similarly-colored fingerboard. Because of these colorings, it functions visually as an industry-standard piece of equipment, and will blend in any setting of classical string instruments. Its body, made of spruce and maple woods, is shaped like the most common violins, as its ribs flare out, its top and bottom curve, and its f-holes are of standard orientation. Mendini uses a package to sell the MV200; the combination includes a protective, lightweight case and a bow that is made of Brazilwood and with “unbleached genuine Mongolian horsehair”. 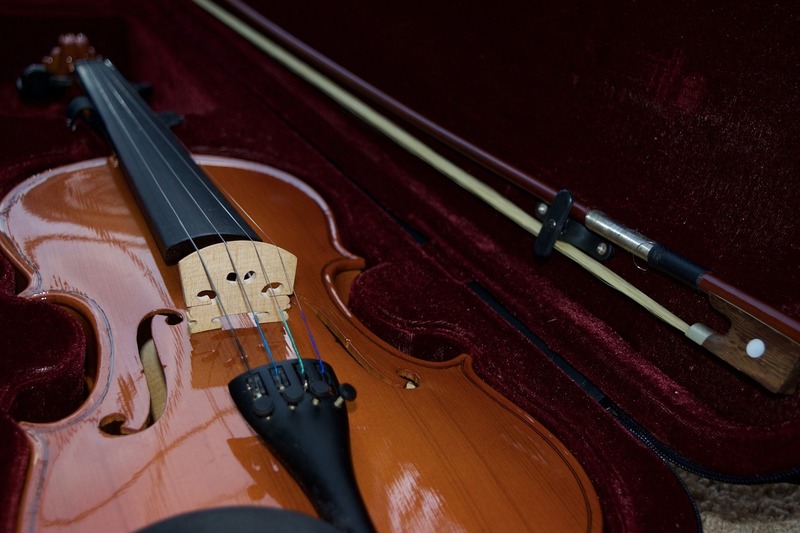 Rosin, which is essential in using the bow to bring out the most audible and pleasing sounds, is included, as are a shoulder rest, two bridges, and an additional set of strings. These features all make the deal to be one worth considering, even without knowledge of the price. 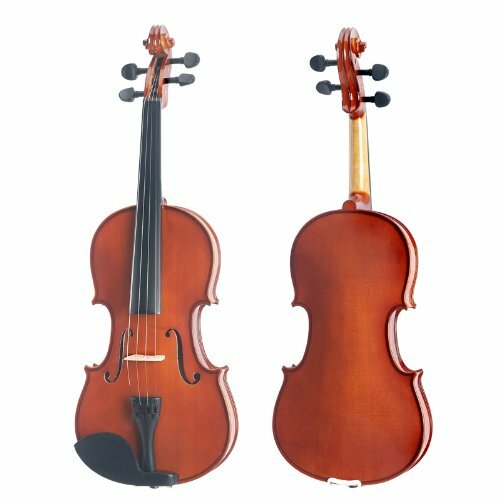 This makes it one of the cheapest violins for beginners on the market. Its low price, however, does not render it a poor violin. Though not held with the same esteem as some high-tier companies are, it is a fine instrument for beginners, and can be used for some time before an update becomes called for. The MV’s uniqueness is apparent upon sight – its surface is colored something other than brown. Available in a range of shades, including black, blue, pink, purple, and white, the MV can spark the interest of many a passerby, and, in making the user appear vibrant and eccentric, is likely to attract conversation from many an artistic character. Though the MVs are tinted, they are hand-carved and made with a “spruce top with maple back and sides”, and are thusly rooted in tradition and upholding of widely-used industry standards (it is true: looks can deceive). Their tuning pegs and fingerboards are also made of maple, and their chin rests and tail pieces are black. F-holes are imbedded into the MV’s surface, and the violin’s curvature is akin to that of instruments used by pros from the 19th century to today. A wooden bridge holds the strings in place, and keeps them at a comfortable level above the fingerboard. Fine tuners are colored to blend into the tailpiece they attach to. All of these assets make the MV to be an instrument acceptable for any beginner’s usage; a student will not find anything lacking in this object. The MV’s sound reverberates, and speaks metallically and brightly. It works well in carpeted rooms or concert halls with much cushioning, since so much echo comes from the instrument as it is. Beginners will be pleased to find that little effort is needed in order for sizeable notes to come from the violin’s body, and that those grandiose tones heard in movies and musicals are attainable on the instrument. Though the MV does not emit the same organic tones that other violins do, its sounds to shimmer in their own right, and gleam with the musicality of the modern age. The MV is offered by Mendini in a package that contains extra strings (which will come in handy after some months), a shoulder rest (for maximum comfort), a light case (impossible to without when away from the violin), rosin (for keeping the bow’s contact with the string), and two bridges. These items are all staples of any violinist’s rig, and their purchases will prove necessary to anyone who plans on playing for much of the future. The Mendini MV combo eliminates the hassle of shopping for each extra, alleviating a tedious task simply. The MV500 has striking visual appeal. Its front, made of spruce wood, is primarily brown with black spread – it looks like milk chocolate with dark chocolate stirred in places. Its back, made of maple, is streaked with black and gold-brown, creating the illusion of an African animal rushing by. Both sides reflect light stunningly, and shine with the radiance of a clear river exposed to an uncovered sun. Detachable golden fine tuners are inserted into the black tailpiece, and they gleam alluringly against the wood underneath. The violin’s ebony fingerboard is sleek and smooth, causing players to look flashy and allowing them to slide easily. The tuning pegs and chin rest are also black, conforming to modern coloring standards. A violinist bearing this instrument can easily fit in with fellow orchestra or string ensembles members. The sound that comes from the MV500 is swooning and lulling, and can be used to play Romantic pieces by composers like Debussy, Beethoven, and Tchaikovsky. Its tone is deep, and its sound shape is robustly curved; they can be molded into an attractive figure who is capable of seducing any unwary observer or listener. The MV500’s tone works well in environments from cozy sitting rooms and orchestra rehearsal rooms to cruise ship dining halls and outdoor Paris balconies. The strings are capable of producing dark tones that can seep to the core of any listener, and can sound brisk and bright notes. The MV500 package is different from its relatives. Along with a case, rosin, extra strings, two bridges, and a bow come an additional bow and a chromatic tuner. This final, Cecilio item can tell you what note your violin is sounding. It also contains a metronome, which can be set to a multitude of tempos in order to help keep time. The bows are made of brazilwood. As brazilwood is now considered endangered, it might soon be difficult to use on market items. This surely adds a special touch to the bows. The fact of the matter is choosing a violin that can enhance your playing style is an important factor when it comes to your commitment to enthusiastic playing and practicing. Taking the time to choose the ideal violin can pay off beautifully not only in the sound that you are able to create with it, but with the encouragement that you get from using a great responsive instrument. A violin becomes an extension of your body and deserves the time and attention to ensure you are choosing the one that will compliment your personal playing style.